The Stainless Steel Classic Protein Mixer Shaker Bottle is with 28oz large capacity to hold enough water for daily intake. It is made of great quality stainless steel as well as the food grade tritan plastic, healthy to drink.With the special loop and flip top, easy to carry and leakproof for carrying out. What will make you most impressed is the transparent front with visible window and different volume unit to check the water every time for precise amount for protein and muscle powder. Our mixer bottle will be your appropriate choice! 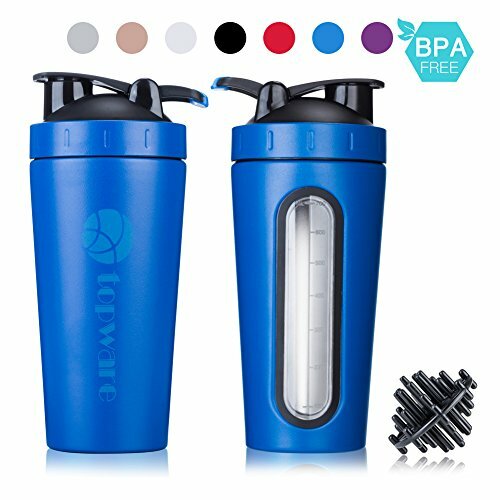 ☆ the stainless steel shaker bottle is for protein mixing, muscle powder mixing, medicine powder mixing, mixing coffee , tea, hot chocolate ,milk, juice and others both for sports and daily use. ☆non-toxic, odorless ,BPA & Phthalate Free, there is no worry and health guarantee to drink from. totally leakproof with the tight open flip top, easy to open and tightly close. No worry for the leaking especially when you go out for hiking or do fitness to put it in your backpack. ☆ Dishwasher safe to be convenient for washing and cleaning. ☆transparent and visible window to check how much water the bottle are holding, which is the most special design for this shaker cup. ☆MIXER BOTTLE: NOTICE: THE WATER TEMPERATURE UNDER 60℃(140℉), the stainless steel shaker bottle is for protein mixing, muscle powder mixing, medicine powder mixing, mixing coffee , tea, hot chocolate ,milk, juice and others both for sports and daily use. ☆HEALTHY TO DRINK:non-toxic, odorless ,BPA & Phthalate Free, there is no worry and health guarantee to drink from. Dishwasher safe to be convenient for washing and cleaning. ☆LOOP TOP DESIGN: durable and strong bottle loop, easy to hold the shaker cup with the loop top design especially when you need more space for other things in your hand, only one finger can make it right. ☆LEAKPROOF TOP: the mixer shaker bottle is totally leakproof with the tight open flip top, easy to open and tightly close. No worry for the leaking especially when you go out for hiking or do fitness to put it in your backpack. View More In Dishes & Utensils. If you have any questions about this product by TOPWARE, contact us by completing and submitting the form below. If you are looking for a specif part number, please include it with your message. Solo Stove Flex Strap Bowls (2 Bowl Set) - Stainless Steel Camping Bowls with 4 Flex Straps. NEW STAINLESS STEEL CANTEEN CUP AND VENTED LID WITH NEW STAINLESS STEEL BOTTLE BACKPACKING STOVE AND NEW SMART SOURCE WATER BOTTLE 40oz.